For the first time, a toilet with a mechanical cistern was designed for the Queen of England in 1596. But the lack of sewage systems and plumbing prevented the spread of the device. The inventors returned to the development of these sanitary devices only after a century and a half, and the Englishman T. Twyford named Unitas, one of his models, resembling a modern compact, which meant unity. Currently, the types of toilet bowls are distinguished according to the shape of the bowl, the method of installation (floor and hanging), the type of drainage design and the mating with the sewer drain. In addition, the devices are produced from various materials. list of parameters reflecting the cleaning efficiency when washing paper and feces molds, degree of rinsing the bowl from the inside. These parameters are mandatory for all manufacturers. 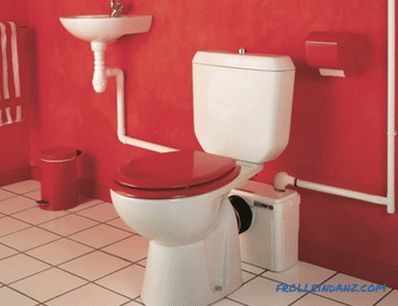 The choice of toilet bowl depends on the comfort of the bowl shape, material, design and operating conditions. The shape of the bowl must provide comfort, hygiene and functionality. And although there are several basic geometric types, different manufacturers have minor differences that are imperceptible at first glance. 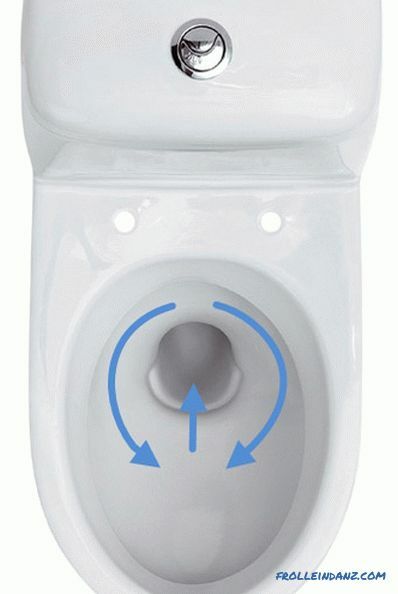 The design advantage is high hygiene due to the location of the funnel in the center of the bowl, which ensures thorough and instant removal of defecation products. Disadvantages include the likelihood of a burst. The design is a flat platform (shelf) for the accumulation of waste, which is cleaned only by the action of a jet of water. Bowls of this type are considered obsolete, and although they preclude splashing, due to low hygiene they are rarely made now. 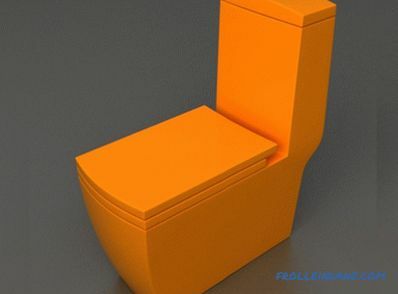 The most common form, the design of which includes a special protrusion that prevents the formation of a splash and bias to ensure the removal of defecation products from the walls devices. In addition to operational parameters, the shape of the bowl should ensure thorough flushing, preventing the formation of salt deposits and splashing of water. These parameters are determined by the symbiosis of the bowl design and the type of flush. 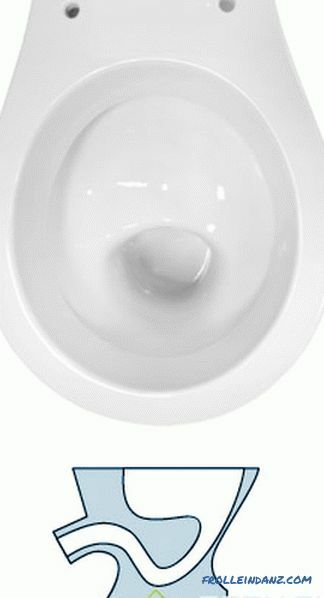 Toilet bowls by the type of flush, depending on the direction of water flow, are produced of a direct or cascade type and back circular (shower type). Both designs have advantages and disadvantages. 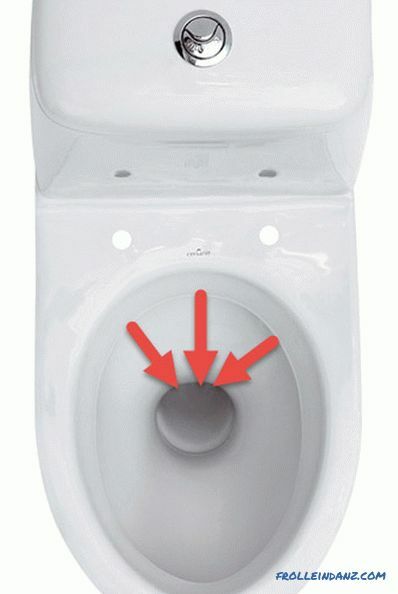 Direct flushing is carried out by flowing water on one side of the bowl. This design is durable, but does not provide high-quality washing of the entire surface. The advantage of the system is relatively low cost. The main disadvantages in addition to not covering the full capacity of the bowl, is the presence of noise and splashing. 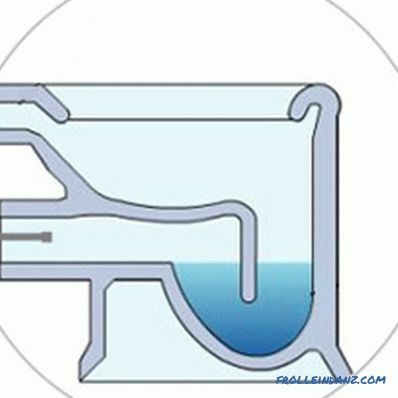 When organizing a circular wash system, water jets are directed at different angles to the inside surface of the bowl and move in different directions . 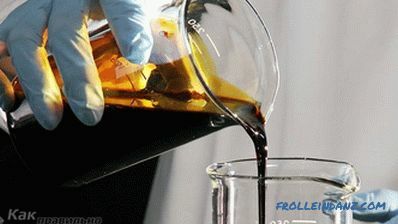 This allows you to process up to 95% of the surface. In addition, the design has a low noise. 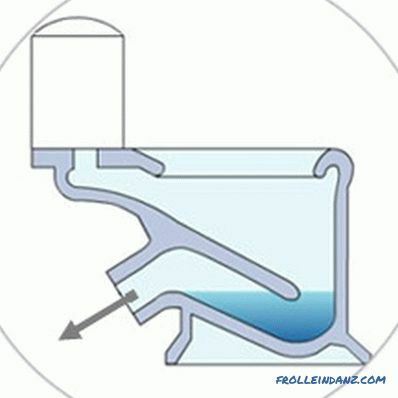 In rare cases, manufacturers design a non-standard drain, which provides for the initial filling of the bowl with water and then a quick descent. This method completely covers flushing the inner perimeter of the toilet bowl. The disadvantages of the design include excessive water consumption, which can exceed 8 liters. The average water consumption in the drain system according to the standard should be within 6 liters, but there are systems that use two modes - full and economical. In the second case, water costs are reduced by 2 times. Other criteria for choosing a toilet bowl depend on the installation conditions and technical capabilities of the sewage systems. Regarding these parameters, there is also a certain gradation of the types of these devices. According to the type of release, toilet bowls come with vertical, horizontal and oblique drainage. The choice of the necessary construction depends directly on the location of the sewer entrance. Horizontal and oblique removal distinguishes the angle of inclination, which for the first option is almost 180 ° (parallel to the floor), and for the second option 145 - 140 ° with respect to the sewer inlet. The use of this type of toilet bowls has become widespread in recent decades, thanks to the laying of sewer communications in the plane of floors, combined with a system of vertical risers.At the same time, the place of connection of the toilet with an oblique outlet cannot be used for mounting the device with horizontal drainage without using the system of adapters - special connections. Oblique release was common when installing sewage systems in apartment buildings in the 70s - 80s of the last century. In buildings of the first half of the last century, the use of vertical release was the most common. In the modern construction industry, the use of vertical outlets is common on both American continents, which is due to the principles of installation of communications, which are mounted without being tied to the walls. This method allows you to install a plumbing unit at any point in the room, and to hide the pipelines through the facing materials of the floor and ceiling. The first toilet was recognized by contemporaries and won a gold medal at the London exhibition in 1884, it was made of faience and equipped with a wooden seat. Since then, the range of materials used to manufacture this sanitary ware has expanded significantly. Faience toilet bowls have low strength and relatively large porosity, which makes cleaning and maintenance of the device more difficult. The use of material in modern production conditions is limited, since the product is fragile and subject to the formation of chips and cracks. The developed technologies, although they can improve these characteristics, but in comparison with other materials used for the manufacture of toilet bowls, faience is significantly inferior. Porcelain compacts have durability compared to faience products, their surface is easily cleaned, and durability allows using not only in individual toilet rooms, but also in public institutions. The only, but significant disadvantage of porcelain is a significant cost due to high production costs. To reduce costs, ceramic toilets are widely used, which, unlike porcelain, have a lower degree of surface glaze, more weight and less durability. Plumbing equipment made of metal (with the exception of gold) is of a classical type and is installed in public toilets. Products have high strength and are easy to clean, but have a relatively high price. The most popular are cast iron toilet bowls, due to their large weight and low resistance of the enamel coating to mechanical damage. 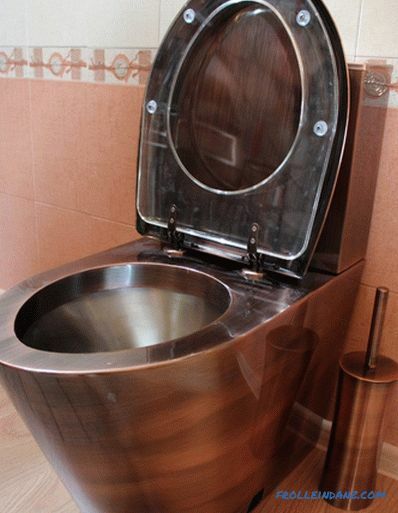 The photo shows a stainless steel toilet bowl. Toilets made of glass, artificial or natural stone belong to the category "modern". 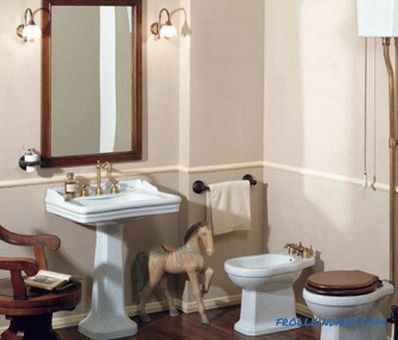 These sanitary devices are distinguished by their high price and exquisite appearance. The lack of durability for toilet bowls made of glass and natural stone is compensated for by the use of artificial substitutes that visually and tactilely give in to their natural counterparts. 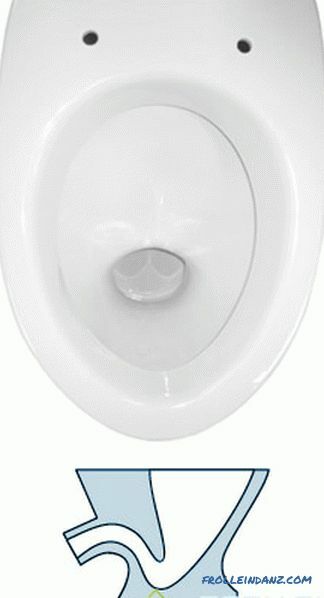 Modern technologies allow making toilet bowls from reinforced acrylic. These products have high durability, are easy to maintain and have almost no porous structure, which is the maximum indicator of hygiene. The disadvantages of plastic plumbing fixtures include susceptibility to deformation caused by mechanical stress or high temperatures. 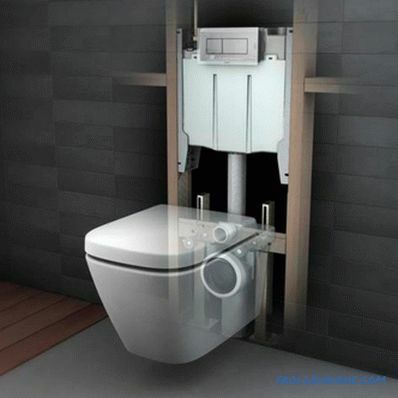 Depending on the installation method, the toilet bowls are divided into wall-mounted and floor-mounted ones, and the floor-standing ones are divided into simple and mounted close to the walls (wall mounted). 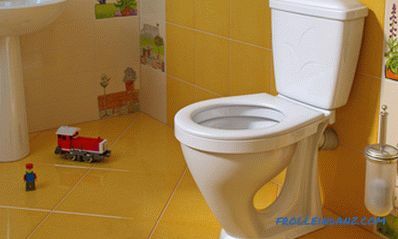 Floor toilets are distinguished by their low cost and ease of installation. Floor sanitary devices are recommended to be installed in spacious toilet facilities. Installation is made on anchor bolts and takes a minimum of time. 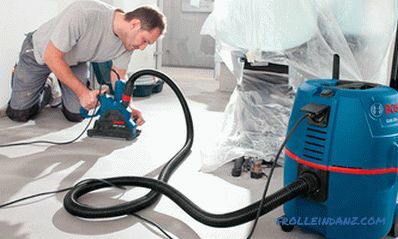 In addition, this design allows you to make dismantling without harm to the flooring. Attached (wall) structures are used for installation in small toilet rooms. 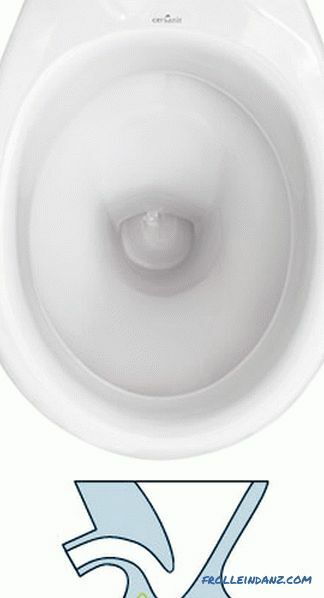 Wall-hung toilet bowls designed with a special flush system are not inferior in size to hanging models. 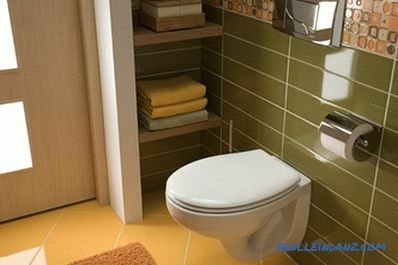 Among the toilet bowls, you should select a special-shaped toilet that can be installed in a corner. 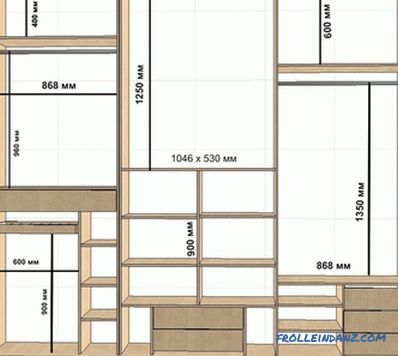 It is not only a designer find, but it can also be a very practical solution in organizing a bathroom. 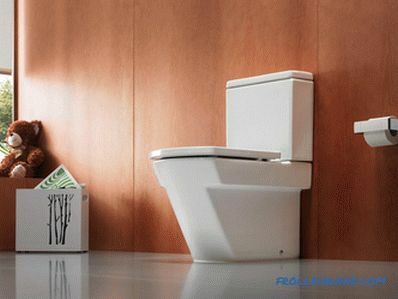 The wall-hung toilet is designed for installation in small rooms. The fastening system of these devices is designed for a load of 400 kg or more.The advantage is more accessible space for sanitary cleaning, and the space saved allows you to complete the bathroom with a bidet in a small space. Bowls are fixed above the floor surface and mounted in block or frame method. 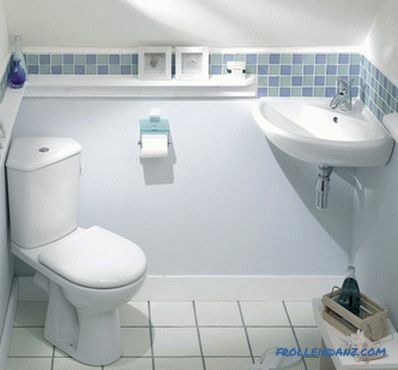 The frame design provides rigid fixing of the toilet to the wall and floor and is located inside the false wall. The required fittings and pipes are attached to the structure. In contrast to this method, block mounting involves attaching the frame to the supporting wall. The depth of installation is 150 mm. Space saving is possible only if the existing “false” structure is used or when special niches reinforced with metal beams are installed. In the photo there is a hanging toilet in the classic version. 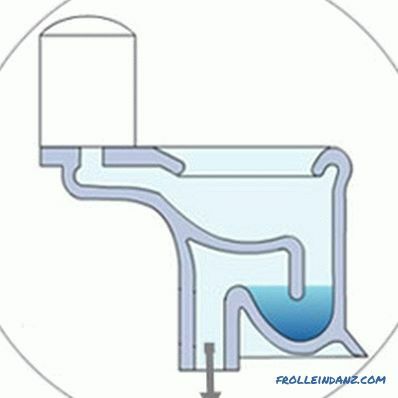 There are several options for placing the toilet tank, but depending on the connection with the toilet, there is a separate and joint type of construction. The tank is mounted under the ceiling and connected to the toilet with a plastic or metal piping. The drainage device is controlled by means of a lever that is extended by a flexible handle on a chain, rope or similar material. The design was developed more than a century ago and as an advantage it has a natural high discharge rate, which ensures high-quality operation in comparison with other analogues. Modern separate systems are mounted with a concealed cistern, which in the open version has no aesthetic appearance, but there are also decorative options. A joint construction (compact) implies attaching the tank directly to the toilet or on a monolithic shelf. This system is widely distributed as it does not require additional installation work and involves less use of materials. In addition, the compact can be located regardless of the distance to the walls and the ability to use vertical surfaces as a carrier. The most common option for fixing the toilet bowl. This is a kind of toilet bowl combined with a cistern, but the cistern is not attached to the toilet with the help of balts and rubber sealer, and the entire unit is cast at once. This design is more reliable and hygienic, but it is more cumbersome. To perform design decisions or to increase the space in the toilet room, modern flush cisterns can be mounted in a hidden form using a false wall. The tank should be made of plastic, and the device should be mounted using the frame method. Buttons or control levers are brought to the surface with the help of special mechanical extenders that are provided for by the tank structure. Most often, such a system is used when installing wall-mounted toilet bowls. Modern sanitary equipment, especially for the device of public toilet rooms, use toilets with a drain system directly from the pipeline. Water is supplied from the water supply and is controlled by a mechanical or electronic valve. In health monitoring devices of the human body, etc.